Combine all ingredients EXCEPT cheese into a large mixing bowl. Mix until JUST combined. Overworking the meat will make it tough. Place about half the mixture into a loaf pan (I use a standard glass bread loaf pan: 9 inches, by 5 inches, by 2 inches.) Press a hole into the centre, working the meat up the sides a bit. Add 1/2 cup of grated cheese (or more if desired, but just remember you need to cover the cheese!!) Add remaining meat and cover the cheese. Press down until even across the top. Add meatloaf to oven and baked, uncovered, for 10 minutes. 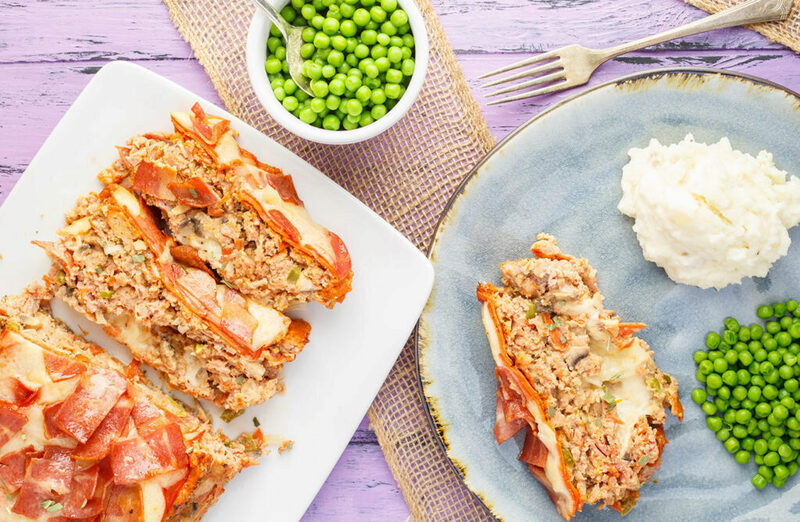 Remove and place a couple of tablespoons of pizza sauce, extra turkey pepperoni, cooked turkey bacon, and remaining cheese onto meatloaf. Place back into oven and continue cooking until internal temperature reaches 165F, about 40 more minutes. Remove, allow to cool slightly, carefully remove, slice and serve! Or slice right in the pan! Notes: You can free-hand your meatloaf onto a baking sheet covered with parchment paper if you do not have a loaf pan. When removing meatloaf from loaf pan, try inverting onto a cutting board or plate and quickly turning right side up so you don't lose the topping! Add more pizza toppings as you see fit (or take them away! ).